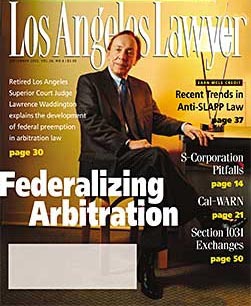 During his twenty one years as a judge of the Los Angeles Superior Court, Judge Waddington served in the Law & Motion Department, Writs & Receivers Department, and trial court in civil litigation. In addition he presided over probate, personal injury, employment and civil rights trials. He maintained a settlement calendar for a variety of pre trial hearings. Judge Waddington is an Adjunct Faculty member at Pepperdine University School of Law, and has authored numerous articles in the Los Angeles Daily Journal (most recently, November 2011), the ABTL News Letter, ABOTA, and the World Arbitration & Mediation Report. Judge Waddington combines his extensive trial experience in civil litigation and his academic record to mediate and arbitrate civil cases. A Fulbright Scholar, Judge Waddington was appointed to the Adjunct Faculty of Fordham University School of Law during his sabbatical in 2001. He has just published a new book entitled "Deliver Us From Evil". Lawrence Waddington, former Assistant Attorney General for the state of California, is a retired judge of the Los Angeles Superior Court. He has authored two law books, published several articles in magazines and newspapers, and directed a television series on criminal law and procedure. He currently lives in California.